The social network is trying to improve its image by making changes to its privacy settings. Under pressure from organizations and associations for the protection of privacy, Facebook again changes its privacy settings. The social network has set up a "shortcut" to its billion users can more easily manage their account. "Our goal is to ensure that people understand how they can control their information" , said Erin Egan, Chief of related to private data from Facebook. Starting next week, it will be possible to change the settings easily. By clicking the icon resembling a padlock, the user will access a list of questions: "Who can see my content? , "" Who can I contact? , "" How to prevent a person from contacting me? " . You just have to select people or groups can access the account. Controlling the release of the photos was also reviewed. 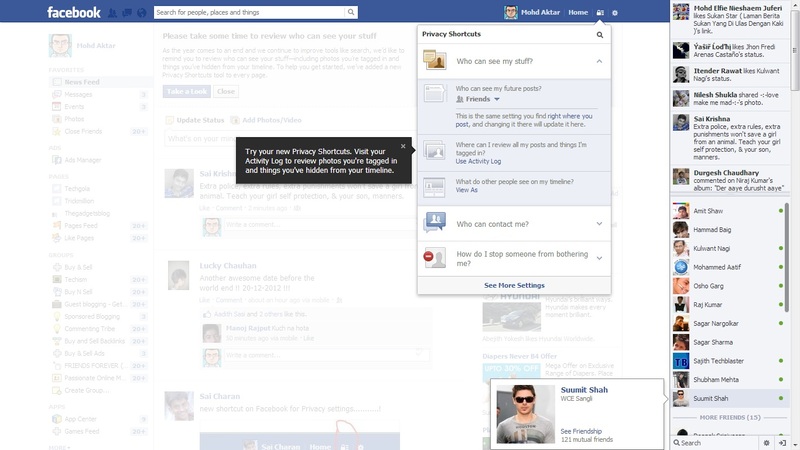 Member of Facebook can select multiple pictures and ask its author to untag or remove the photo the social network. The user will then receive a notification when changes have been made. However, the people who posted the pictures will still be required to remove them. Another significant improvement: the applications integrated with Facebook will now request separate authorizations for access to private information or post messages on the log members. So far, the two applications were consolidated into one. Note, however, that this change will not affect the games. However, if Facebook is making efforts on certain points, it fell on others. The site of Mark Zuckerberg wants to combine the information it collects with those obtained by other companies, including its subsidiary Instagram , program editing and sharing photos. Moreover, it will not be possible to no longer appear in the Facebook search engine. The social network justifies the latter modified by a small number of users (less than 10%) who use this feature. The new rules of confidentiality will be set up by next week, despite an unfavorable result in a vote held among its members. Facebook has also indicated that it would remove this voting because participation unreasonably low, with less than 1% against a minimum of 30% set by the social network.